As with all the dishes listed in the main course section, this Stuffed Acorn Squash is super simple and won’t take up any extra time while you’re cooking the rest of your thanksgiving feast. 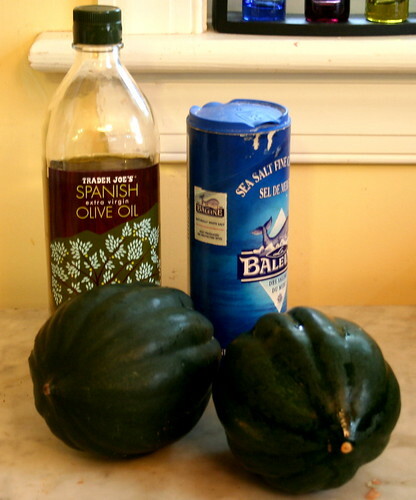 The oven does almost 100% of the work for you and if you’re already making up a gluten-free stuffing, then all you need to do is stuff the roasted squash with the stuffing and cook the stuffed squash for another 40 minutes, same as you would if you were only cooking the stuffing. Serve the squash with some gluten-free gravy on top to pull it all together and you’ve got one delicious, simple, and satisfying turkey-alternative! 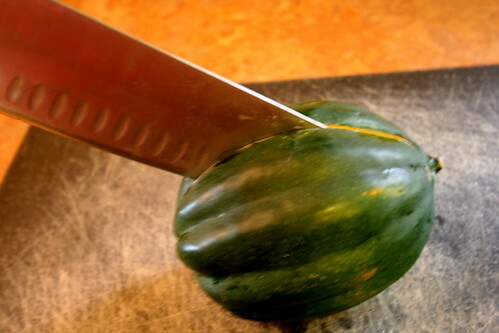 Cut the acorn squash in half lengthwise. Scoop out the seeds and stringy insides. 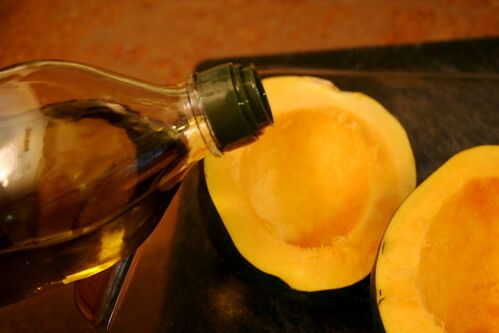 Place cut-side-up in a baking tray/dish and drizzle the olive oil on top. 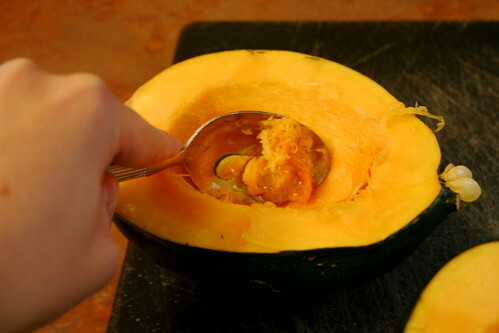 Use your fingers (or a pastry brush) to evenly coat the orange fleshy part of the squash. Evenly sprinkle the salt on top. 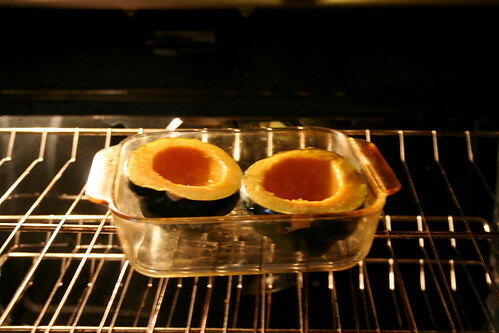 Place in oven and bake for 35-40 minutes, until the squash is tender when poke with a fork. 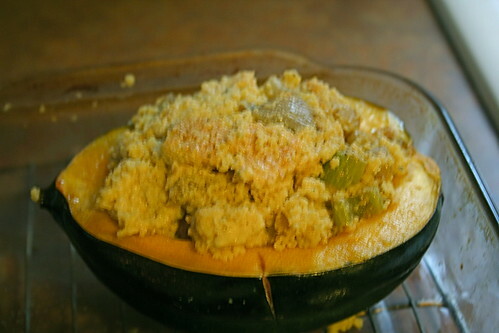 Remove from oven and fill the halves with the cornbread stuffing. 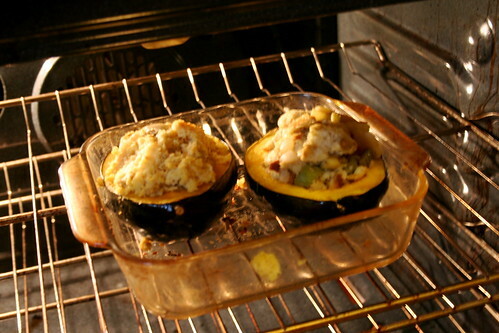 Cover each half with tin foil and place the stuffed squash in the oven. Bake for another 20 minutes. 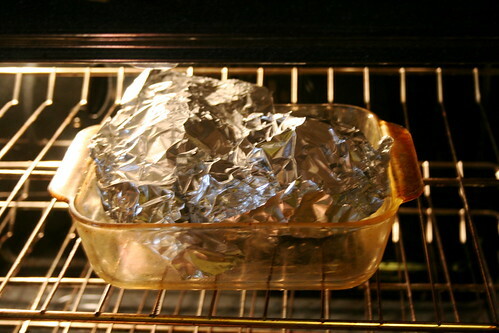 After 20 minutes, remove the tin foil and bake for another 20 minutes, until the stuffing is brown on top. 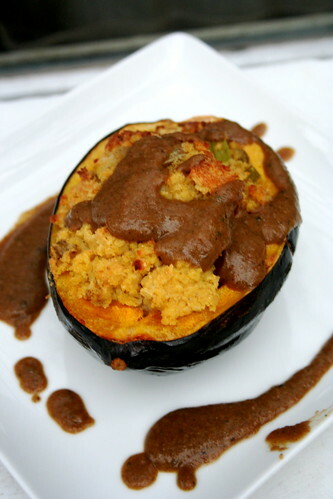 Remove, let cool, and serve with gluten-free vegan gravy!